We cannot look at historical figures without the telescope of history, so it’s hard to judge what our contemporaries will look like to the ages. As hostages of living memory, we get caught in the fever of the times and think with our hearts and not our heads. Margaret Thatcher is such a figure. To some, she was the embodiment of all that is wrong with representative government — the conservative terror that nightmares all “progressive” dreams. To others, she was a Joan Bull of Britain, standing with Elizabeth I, Nelson and Churchill in the stubborn defence of British attitudes and values. Regardless, she was Britain’s first female Prime Minister and held that office for eleven years, longer than anyone else in the 20th century (including Winston Churchill.) 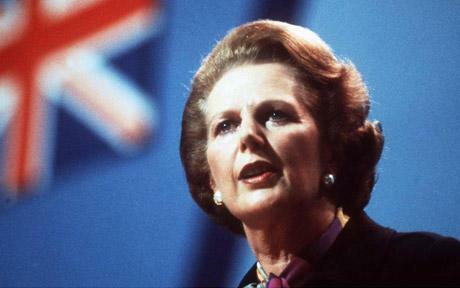 And, like it or not, she revolutionized politics in Britain and around the world. For me, Margaret Thatcher still represents hope. In her, I see the enlightened idea that we are citizens of our country not clients of it. We, each of us, are personally responsible for how all of us make our way in the world. We should not download that responsibility onto distant bureaucrats; nor put our faith in the chimera of government programs which history has proven unworkable and unsustainable. In 1987, Margaret Thatcher summed it all up in an interview, when she said, “It is our duty to look after ourselves.” and I believe she was right. So the old girl was human after all. A. This entry was posted on April 8, 2013 by wdfyfe in History, Politics and tagged History, Margaret Thatcher, Prime Minister of the United Kingdom.